Inaugral Golf Day Off To A Flyer! The Inaugural Guiseley Community Foundation Golf Day was blessed with wonderful weather and was aided by the hospitality afforded by Horsforth Golf Club. 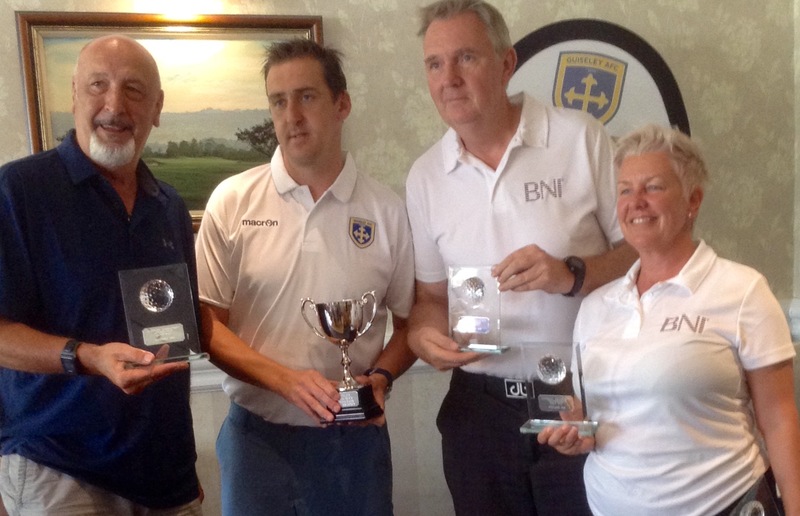 Eight teams took part with the overall winners being the BNi team of Steve Bennett, Sam Ferrington, Julian Balatoni and Danny Oliviera with 96 points. They edged home ahead of Team Taylor whose members Peter and Steve Taylor, Mick Hogan and Pat Carnall notched a score of 95. In third place were the Triple J Investments team of James Mason, Jas Atwar, Jay Butler and Jim Emmett on 92. Organised by Guiseley Community Foundation Manager Steve Taylor and his father Peter the event ran smoothly with the off course assistance of Rachel O’Connor and Susan Clapham. In making the presentations Steve Taylor thanked all who had taken part and helped to raise funds for the Guiseley AFC Community Foundation. Next Post:Goalkeeper Coaching and Little Lions Programmes Prove To Be A Success!